Say, baby, how about a quickie? Jesse Chambers is the daughter of two Golden Age heroes, Johnny Quick and Liberty Belle. When her father died in battle with the villain Savatar, Jesse took up her father's speed forulma to become Jesse Quick. This member of the Flash Family was originally an X-Men Rogue figure, with goggles culled from the JLA Impulse. This costume is an amalgam of two of Jesse's looks, and was really very easy to do. 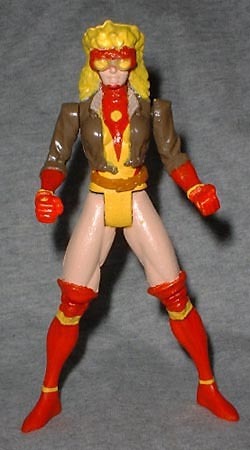 Jesse Quick is 5" tall, and has seven points of articulation. With the Rogue figure very easy to find on online auction sites, this is a figure pretty much anyone can make. Who's your favorite member of Flash's "family?" Tell us on our message board, the Loafing Lounge.